Students, alumni, and other school community members gathered at St. Ignatius College Prep School, Chicago, last week to support Matthew Tedeschi, a gay teacher who was fired from the Jesuit institution this spring. Bondings 2.0 readers may recall that Tedeschi was fired after he repeatedly complained about students harassed him for over a year about his sexual orientation. The students had learned about his being gay from searching his online dating profile. 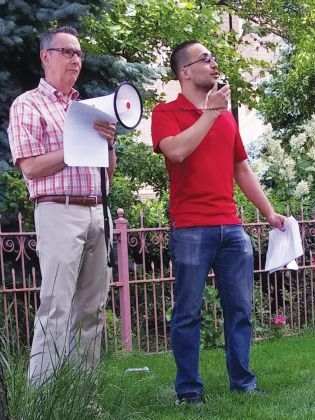 Matt Tedeschi (right) addresses the protestors, while supported by Chris Pett (left). “First of all, Tedeschi wants the school administration to change its nondiscrimination policy to include sexual orientation and gender identity. Next, he wants the administration to allow the LGBT student organization to post flyers in the school and make online announcements, similar to other student organizations. As of now, he said, the group is not allowed to do either of those things. The fired teacher was joined at the protest by Chris Pett, the incoming president of DignityUSA, and Colin Collette, a former music director at a Chicago-area parish who was fired when his same-gender marriage became public. While Tedeschi said that one of the reasons he was fired was because he “undermined authority,” he also said the administration failed to offer examples of how he supposedly did so. Tedeschi’s requested changes at the school are all in line with Catholic teaching and values. They should be changes that all Catholic schools institute as a way to show that they are living up to their best ideals about non-discrimination of LGBT people, as well as Catholic social teaching about workers’ rights. New Ways Ministry has been encouraging Catholic institutions to adopt non-discrimination policies to protect LGBT employees. For more information on how to start the discussion of such policies in your Catholic community, click here.